CEDAR FALLS - Louise Bergeson, 84, of Cedar Falls, formerly of Waterloo, died Wednesday, Aug. 3, at Western Home Communities Windhaven. 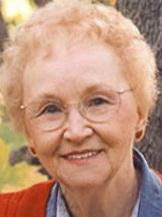 She was born Sept. 4, 1926, in Rowena, S.D., daughter of John and Inga Bratlie Thorson. She married Marlowe E. Bergeson on Aug. 9, 1947, in Waterloo. He died Nov. 7, 2004. Survived by a son, Greg (Sue) of Marshalltown; a daughter, Lynette Jordan of Waterloo; five grandchildren, Adam (Sarah) Bergeson, Benjamin Jordan, Michelle Shively and Elyse and Megan Jordan; a great-grandson, Isaac Shively; a brother, Norman Thorson; and a sister, Alice (John) Evans of Williams. Preceded in death by her parents, four brothers and a sister. Services: 10 a.m. Saturday at Pilgrim Lutheran Church, Waterloo, with burial in Waterloo Cemetery. Visitation from 4 to 6 p.m. Friday at Dahl-Van Hove-Schoof Funeral Home, and for an hour before services Saturday at the church. Louise's greatest joy was her grandchildren. The loving care she received from the staff at Windhaven and Cedar Valley Hospice is deeply appreciated by her family.